Note: I wrote this just after the fabulous photos came back from the Pluto New Horizons mission but only had a chance to post it now. Once it was a round dot in the night sky, distant, cold, too small to be a planet, too far to be on one’s mind. It was a dead rock in space, accompanied only by a moon almost as large as itself, with whom it danced about their common center of mass. 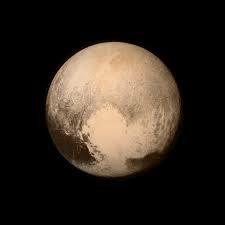 Discovered by American astronomer Clyde Tombaugh in 1930, Pluto was far less interesting than the nearer planets. It famously lost planetary status in 2006, being demoted to ‘dwarf planet’ after the discovery of similar-sized objects in the Kuiper belt. Science fiction writers dreamed up fantastic scenarios, such as Stephen Baxter’s lovely “Gossamer” (1995). I was never all that interested in Pluto, which paled quite literally before the mysteries and gorgeousness of such glamorous rivals as Jupiter and Saturn and their moons. Then in 2005 two little moons of Pluto were discovered, Nyx and Hydra, and in 2012 Kerberos and Styx joined their numbers. Pluto had courtiers! I had the chance to let my non-science students infer the presence of these moons on their own from a series of photos, much as Galileo did with the Jovian system. A great teaching moment, especially in the absence of much press coverage (combined with the general lack of interest American students exhibit in keeping up with the news) but it didn’t really turn me on to the Plutonian system, which was, after all, still blurry and distant. Now, in 2015, I am grateful to have seen, along with millions of other people, the face of Pluto in gorgeous detail. And I’m in love!